After a night stranded in Vienna airport due to the winter storm in Washington, D.C., I’ve made it back safe and sound from my Viking Christmas Market cruise along the Danube. Although it was bitter cold throughout my trip, there was a gentle snow fall in every port that made this unique voyage a bit magical. I had traveled from one snow-globe city to another, stopping for a mug of rich hot chocolate or mulled wine in each bustling marketplace while the season’s spices lingered in air. Most mornings were filled with a breakfast buffet aboard the Viking Europe, followed by guided shore excursions in the afternoon (which are included in the cruise price). However, our first day was spent sailing along the Danube until the early evening when we arrived in the city of Linz, Austria – leaving a few hours to shop in the Christmas market at our leisure. Then we headed to Salzburg by bus for our first guided shore excursion, and along the way we past some incredible scenery. The clouds met the snow covered mountains in way I’ve only seen in tropical climates – like Jurassic Park set in the Ice Age. Tucked away high in the mountains, Salzburg offers panoramic views that are straight out of a story book – and it is. The classic musical, the Sound of Music (based on the novel by Maria von Trapp) was filmed here. After visiting Salzburg, one of the highlights of the cruise was a visit to the Melk Abbey, a Benedictine monastery founded in 1089. 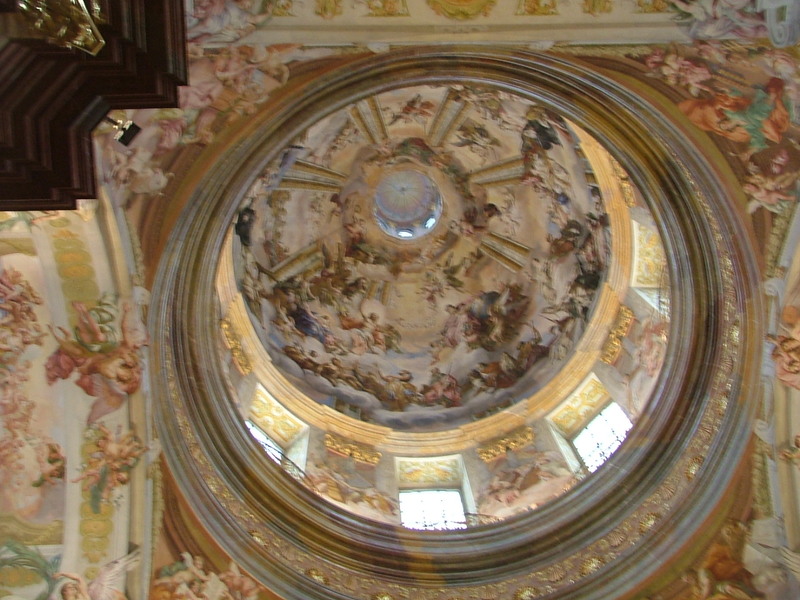 The abbey sits high above the village of Melk, with high painted ceilings that formed optical illusions. The dome of the cathedral was designed to “bring Heaven to earth,” so that when church-goers gaze up, they can “see” the entrance to Heaven. Our guide here was wonderful – she was knowledgeable, funny, and kept everyone’s attention throughout the tour with interesting tidbits of information. Each night when I returned to the ship, I’d curl up with a warm cup of tea while waiting for dinner to be served in the dining room. The cuisine aboard the Viking Europe exceeded my expectations (especially the fabulous soups), however there weren’t many alternative options and entrees tended to be heavy (a number of pan-fried dishes). If passengers chose to skip the 7p.m. dinner, there were no late night alternatives or room service, but complimentary tea and coffee were always available. Immediately after dinner, most passengers made their way to the Viking Lounge for scheduled entertainment, including informative lectures and live musical performances. The ship continued on for a short visit to the medieval town of Durnstein (which in the summer is adorned with vineyards) before docking in Vienna. 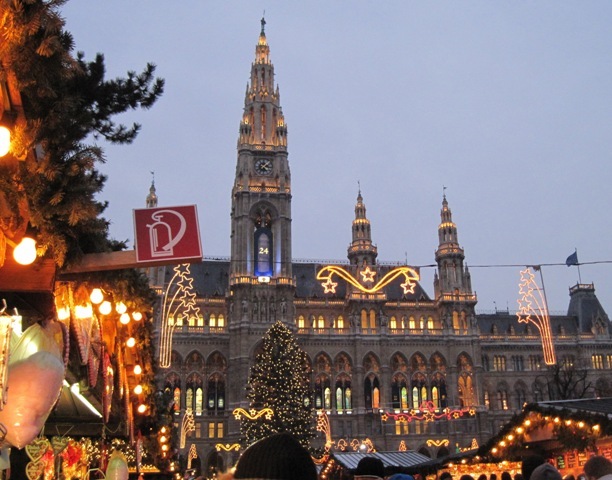 After taking a walking tour of the city, I headed to Vienna’s Christmas market. It’s easy to spot with colorful Christmas bulbs and decorations hanging from the trees in the park, and the smells of sausages sizzling at a number of the stands. Budapest and Bratislava were the final two ports on our voyage, and I wish we had more time in each of these cities. Budapest appealed to me because both parts of the city (Buda and Pest) had something different to offer. Pest is the newer of the two, with most of the architecture dating back to the 19th century, while Buda is perched on a hill across the Danube with sweeping views of it all. As we sailed into port, the crew gave a brief narration about the historical sites that make Budapest the “Pearl of the Danube,” while passengers snapped as many photos as humanly possible. Bratislava is an underrated, and technically youthful city (it became the Provence of Slovakia’s capital just 90 years ago), but has a history dating back to pre-Roman times. Communism left its mark, but much of the Old Town has been completely renovated leaving radiant structures with cast-iron balconies overlooking quiet cobblestone streets. Although we only visited for a few short hours, there was an ease about Bratislava that invited me to return. As we made our way back to the Viking Europe through the powdery snow, I thought back to each of the whimsical snow-globe cities we’d visited on our itinerary and the ever-present tingling in my toes didn’t seem to matter.